1/ Combine all the dry ingredients (salt, sugars, oregano, onion power, garlic power, paprika) in a bowl. 2/ Rub the pork shoulder with the olive oil until absorbed by the meat. 3/ Generously rubdry mixture on the meat’s surface. 4/ Program the application to a customized setting of 200°F/93°C and insert the meat°it probe into the thickest part of the shoulder. 5/ Baste the meat regularly with the apple juice. 6/ Once the temperature has reached 160°F/70°C, it will increase more slowly (this is known as the floor). To speed up the roasting, place the meat in a pan with a bit of apple juice covering the bottom and cover the pan with aluminum foil. 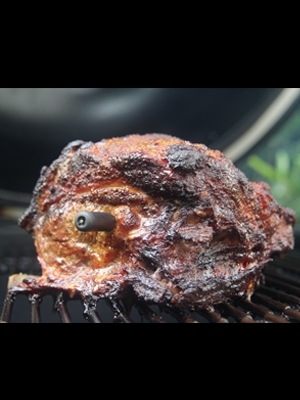 7/ Take the pork out of the oven once the probe alerts you to the end of roasting and shred the meat.